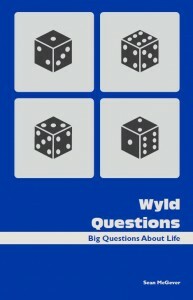 Wyld Questions is aimed creating junior high school conversations covering eight questions many junior high students ask. The Bible study portion of Wyld Questions could be done by people of any age, but the format, the dice, the visuals, and the object lessons have been intertwined in this study to engage junior higher students right where they are at. What does God have to do with my life? Can God love someone like me? Why is this world messed up? How does God look at me? What do I do when I mess up? How can I know an invisible God? Wyld Questions is $4 plus shipping. Wyld Questions Case of 100 (20% Discount) plus shipping. It has become clear to me that the questions we ask are as important as the answers we give and that is why I am grateful for Sean’s work on Wyld Questions! I am consistently surprised by the depth, intellect and wisdom that Junior High students possess and how clearly they grasp key theological concepts of Life, God and Life with God. I am Grateful for this Study! If you’ve been a leader for a while, you know the feel of dread when you realize you haven’t come up with a Bible study for your campaigners group the next morning. Good news…Sean has provided a quality campaigners plan for eight weeks to give you a breather! Wyld Questions is a well thought out campaigners lesson plan, complete with scripture, questions, and a format that will keep your group’s interest. It’s engaging, fun, and appropriate for our middle school friends. I highly recommend it! I have lead WyldLife in one form or another for nearly 3 decades. What Sean has put together is simple, deep, and interactive. I can see this being a great tool for young leaders who are always looking for a way to get the WyldLife kid engaged… way to go Sean! Campaigners is an essential tool for us in Young Life, especially when it comes to “…helping adolescents grow in their faith”. We often struggle though when it comes to Campaigners for our WyldLife ministries. Sean McGever has created a resource that can change this for your area and your leaders. I encourage you to take a look. Over the past 16 years in Young Life I have seen Wyldlife ministry grow, yet most of the campaigners tools most widely distributed are for high school age. This tool was reviewed by our staff and we cannot wait to get it into the hands of every Wyldlife leader to accomplish Young Life’s mission of “helping (middle school) kids grow in their faith.” Using this skillful series of age-appropriate lessons and creatively engaging lesson plans, I believe leaders have a fantastic tool to effectively invite younger aged kids to lean in and talk on a deeper level around the Bible. Great work, Sean.